The Great Outdoors Challenge 2018? This year I was lucky enough to walk across Scotland on a route I devised after being accepted on The Great Outdoors Challenge (TGOC) with my partner Lynn. The route I chose was a relatively easy crossing- sticking to low level paths and tracks with the odd high level pass thrown in for good measure along the way. This was our first challenge and both of us have never done a walk of this length before in one go, so choosing something reasonably easy and across a lot of familiar ground was a wise decision- although we found it fairly easy going even with big packs. Along the way, we many many new friends with other challengers and we discovered that this was a yearly essential in many people’s walking calender- quite a number of people were on their tenth crossing! Addictive was the word we heard again and again from other people- although at the time I failed to see why so many people would do the challenge year after year- but I will get back to that one later. Our chosen route was one I enjoyed and I would have only changed the day we walked from Garva Bridge to Newtonmore as it involved a fair bit of road walking and as it was a warm day- our feet objected to the tarmarc bashing in the heat! Osprey Atmos AG 65 Pack: I’ve had this pack for well over a year now, its not the lightest of packs, but its the comfiest pack I’ve had and dont intend to change it at the present. Tarptent Scarp 2 Tent: This tent served us well on our walk- great interior space and having two porches was good too, although what we did sometimes was to store both packs in one porch and cook in the other. The weight of the tent for the trip was around 2 kilo’s which equates to a kilo per person, so cant complain there- although we could have used a lighter tent, but I didnt want to compromise on space. Meindl Minesotta GTX Boots: Great reasonable light weight fabric waterproof boots which were great on the walk- I only had one small blister which I think was the result of the day when we did some road bashing in the heat, as I’ve never had any problems at other times with these boots which I’ve worn a lot. Wear and tear on the soles were miminal and they kept water out for the duration of the trip, although now they have started to leak- I’m going to see if Meindl with cover this under their warranty. It was great to complete the challenge, and at the end I wish I could have turned round and walk back to the west coast! It was a great achievement and very satisfying to do this walk coast to coast and yes I’d like to do it again. Pick your starting point on the west and your finish point on the east and plan your unique walk across Scotland- making many new friends along the way and seeing some fantastic scenery with some great wild camping locations. Now I see why its addictive! Its now only a month away before the entries for the TGOC 2018 goes live and I’ve already been looking at possible routes- lets hope we are accepted for next years walk! TGOC 2017 Day 4: Fort Augustus to Garva Bridge over the Corrieyairack Pass. The weather for the day was looking grim with high winds and rain forecast, but it started off fine enough. We left the campsite around 8.15am and soon met up with fellow challenger Billy Liddel. We spoke for a few minutes and then Billy soon left us behind. Billy was eager to get moving as he was doing his walk on a shorter time scale than us. On that subject, myself and Lynn made up a few nicknames for a few challengers! Billy was named ‘Billy Whizz’ by Lynn after the cartoon character and in my eyes he was the ‘Flash’ That was the last we saw of Billy on the Challenge and he indeed finished the challenge a few days before we did! From Fort Augustus we took tracks and back roads before picking up the start of the famous General Wade’s Corrieyairack Pass which climbs from Fort Augustus near sea level to a height of 770 meters above sea level. The pass starts off by heading up a lovely hillside path with some overgrown gorse bushes for company to contend with, then picking up a hill track passing Culachy House. After some short steep climbs, the weather did infact deteriate and we were glad to reach the small but cosy Blackburn Bothy where we stopped for a wee break where we met Rob and as we left we bumped into Donna and Willie again. The Corrieyairack is a long steady climb which seemed to be never ending. To make matters worse or perhaps I should say to make the walking more difficult, we were faced by a strong headwind and Lynn walked on behind me using me as a windbreak! Finally we made it to the top of the pass catching up with Rob and another challenger whom I shall call Mr Alpkit as he as adorned with Alpkit clothing- perhaps they had sponsered him? This wasnt a spot to linger and we soon started our descent to Speyside to drop down out of the wind. Mr Alpkit had stopped halfway down the hill to get a bru on with his Alpkit stove, as we continued to drop further down the pass. Next Rob decided to stop as his feet were giving him problems and shortly afterwards we found a sheltered spot by a burn to have lunch by and restock on water. Soon we were on our way again and walked the final few kilometers to Melgarve Bothy at the Bottom of the pass in the company of Willie Todd. At Melgarve we had a look inside the Bothy and I made the mistake of having a seat in the large sofa couch which I promptly sank into and wasnt that keen on getting up again to walk the five kilometers along the single track road to our camp spot for the night at Garva Bridge, but we were soon on our way eager to finish our days walk off and stop for the day. I think the last five kilometers must of felt like ten to Lynn, but we got there and soon the tent was pitched amongst the five other tents already there. Later on once we were settled in and fed for the evening, father and son challengers Eddie and Alistair turned up. They had walked from Spean Bridge that day via Glen Roy and past Luib Chonnal Bothy- a long day! The shelter they were using for the challenge was a Mountian Laurel Designs Trailstar which I’ve been taking a keen interest in lately and this was the first time I had seen one in the flesh. Im still keen on buying one at some point. Lynn doesnt seem keen on the idea, but for solo camping trips- this shelter seems ideal for me. Over the course of the challenge for here on, we would see a lot of Eddie and Alistair at various points whom were great company along the way. By the end of the night I counted no fewer than ten tents dotted around the area by the bridge. It had been a long day and we had a good sleep that night. I was a bit anxious about the next day as it was going to be mostly road bashing all the way to Newtonmore, but on reaching Garva Bridge, I felt I had reached the first milestone on the trip reaching the infant River Spey. We awoke to a slightly damp start on our third day of our adventure. We had both slept well and was as eager as ever to pack up and get going. Like the previous morning, the cloud was low, but we were soon on our way walking along 4km or so of pleasant single track road to Torgyle Bridge to cross the River Moriston. Just as we reached the bridge, Willie had caught up with us and walked with us along the 200 meters of the A887 road until we reached the forestry track which would lead us onto the Old Military road that climbs over the hill to Fort Augustus- our destination for the night. This part of the route climbs up over the Inchnacardoch Forest and started with a moderate climb along a forestry track. We could have opted for a slightly shorter ascent by following the track straight up that follows the large pylons near to the summit of the pass, but this would have been less pleasant and not so scenic. We decided to stick to the old military road all the way up to the top of the pass which rejoins the track near the summit. This was a dog leg or and more like going round three sides of a square, but the walking was more pleasant. The weather cleared up and the sun came out briefly, then a short heavy shower came along. Fifteen minutes later we had blue skies again and the weather improved as the day went on. I seem to recall, that no sooner than I had donned my waterproofs- the shower had died out and I kept my waterproofs on for a short while afterwards just in case, but the rain had ceased for sure and I was begining to over heat. Yet another stop to take the waterproofs off! We were nearing the top of the pass and back onto large fresh bulldozed track country briefly following the towering Beauly- Denny Pylon line. At this stage, we started meeting some people again- a couple bikepacking and more challenges congregating. we met Rob, Donna and Barbera and walked the last few kilometers down a lovely path which wound its way down through the woods into Fort Augustus. It was now a lovely warm day and being Sunday afternoon- Fort Augustus was teeming with people and challengers too! We stopped at a shop for something to eat and drink before heading to the campsite to set up camp. The campsite itself was fantastic- an area the size of a football pitch for and cyclists only which was flat as a bowling green! There was plenty of sun and a fresh breeze, so we set up tent right in the middle to dry it out, being damp from the previous nights light showers. In no time at all, it was soon dry. The rest of the afternoon was spent meeting up with some of the family whom had driven to Fort Augustus to meet us and we went for a late lunch at one of the Pubs by the Locks in the centre of Fort Augustus. We were still on fine form and it was good to reach civilisation and have some proper food, a good shower and get our clothes properly washed for the next leg of our trip. It seems such a long time ago now since I bought last October’s edition of TGO magazine. In the magazine was the entry form for this years challenge walk across Scotland. Lynn was glancing through the magazine and the article for the challenge caught her attention, and it was suggested to me that perhaps we should enter. I quickly agreed to this and the rest, you could say is history! Some years ago, I think back in 1998, I applied and got accepted for the challenge- I started looking at routes, but it all seemed a little to daunting back then and although I had many years of hillwalking under my belt even back then, I decided not to go ahead with it. So last year when Lynn showed an interested in the challenge and with our ever growing interest and love in backpacking, it only seemed right that we should apply. In November we received the email to tell us that we had been accepted- we were both very happy that we were now going to be taking part in this event. 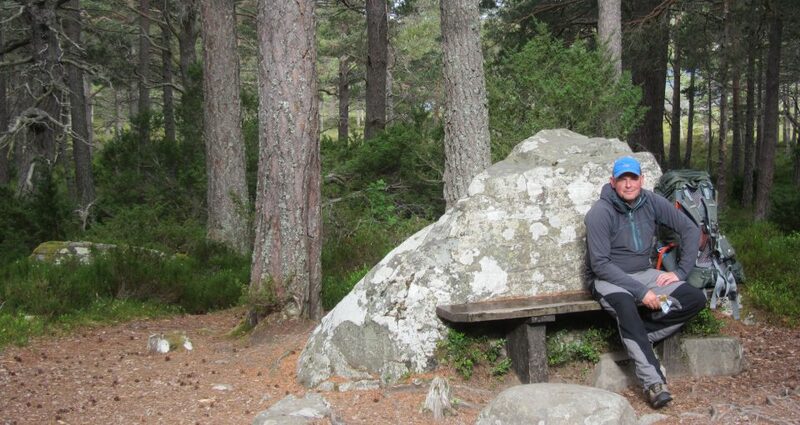 My longest walk had been the West Highland Way many years ago and recently both of us had been on many short overnight trips to the hills and Glens which we loved doing whether it was staying in Bothies or camping. Two weeks of walking carrying a pack with all our gear seemed a little daunting, but it was an exciting feeling and we were confident that we could do this- I did have a niggling worry about my ankle which can play up after a few days of walking, but still this did not put me off. The idea of the Challenge is fairly simple- you get a choice of thirteen starting points on the West Coast and you can finish anywhere on the East between Fraserburgh and Arbroath. We picked Shiel Bridge as our start point and Kinnaber links on the east just a couple miles north of Montrose as our finish point. For our first challenge, I picked a route that was fairly easy which was to take us through Glens and over a few passes. Camping most of the way with the odd night spent in a hostel. The route came in at 190 miles in total and when I was happy with the route I had chosen, I then had to submit the route to our vetter- Roger Smith. The route was accepted back in December. Luckily it was a mild winter and we spent a number of weekends doing some long walks with overnight camps getting used to our big packs. We already had all the right gear for the trip- it was just a case of what would be right for this length of trip and trying not to take too much, as after all, we were going to be carrying everything for two weeks almost! The morning of 11th of May came and Dan turned up at the house at 9.30 promt. He was there to give us a lift across to Kintail Lodge in the west where we would spend our night previous to start day of the challenge. We arrived there early afternoon in glorious weather, and as the afternoon went on, other challenges slowly started arriving. We talked briefly to other challengers that evening in the bar, but decided to have an early night so we would be fresh for next morning! The Great Outdoors Challenge – The Tent. Couple of years ago we bought a Terra Nova Polar Lite 2 Micro tent for our backpacking adventures. It was a small tunnel two person tent- small wasnt the word, perhaps tiny tent designed for two Hobbits is more apt! Yes it was a small tent- two of us cramped together with no room to store hardly any gear inside the tent. Rucksacks and everything else had to be stores in the one small porch which was also the exit. This went that visits to the toilet in the middle of the night in the dark wasnt the easiest of things to do. Also sitting up, getting changed was also a challenge! The good points of the tent were because of the fact that it was of low height and compact, made it totally bombproof- the night we camped at Bynack Stables at Strath Nethy in a howling gale, our tent never flinched! Enough was enough though and I yearned for a roomier tent. Fast forward to Autumn last year and Lynn had noticed a Tarptent Scarp 2 for sale in one of the Outdoor Gear for Sale sites on Facebook. I had been taking some interest in the Scarp 2 for some time, but it was expensive and Tarptent only sell direct from Brand new and it had to come from the States meaning on top of the tent price- I would of had to pay postage and a tax when it arrived in the U.K. bumping up the price even more. The person that was selling their tent, claimed that it had only been used six times. It was still expensive, but after some thought I took the gamble and bought it. We needed a roomier tent and this one seemed to tick all the right boxes size and weight wise. In November, Lynn had some holidays booked and it was rather mild for the time of year. We hadnt been away much over the previous month due to my work commitments, and at the last minute I thought it would be a great idea to walk the Affric Kintail way and try out the new tent! On the first night we stayed at Camban Bothy and it wasnt till the second night that we camped at the east end of Glen Affric by a loch. Our pitch was in a great spot- only thing that let it down was the slight slope we were on, meaning that Lynn kept pushing me to one side! I found the tent easy to put up- thread the main pole through and only six pegs to hold it in place. Pretty simple really. We took the tent out another couple of times after that on some training walks for this years TGO Challenge walk and it seemed to perform well- I even tried out the optional external cross over poles which supposedly turns it into a full performing four season tent! A couple of weeks ago we were at Shiel Bridge ready to attempt our biggest walk to date- The Great Outdoors Challenge. I didnt bother with the optional cross over poles as they add an extra 300 grams further to the tent weight and the forecast ahead looked good, but I did add an extra four guylines incase of windy weather. During the challenge we wild camped and even stayed on a couple of offical campsites. I found the Scarp 2 perfect for two people- it weighs approx 2 kilos which is the same weight as the Terra Nova Polar Lite that we had, but gives us so much more space and this is a truly liveable backpacking tent for two. Setting up the tent is a doddle and is great having the inner attached to the outer which can be seperated if need be. We experimented with this by just pitching the outer only, having a brew under the outer in bad weather, then attaching the inner. But if you have pitched the tent under normal circumstances and weather is too bad for cooking with the porch door open- all you have to do is undo part of the inner giving a larger and save space to cook under. The other little trick I have learned is, after a night of heavy rain when you have to pack up the tent- best to unclip the inner first, then pack it away in a drysack. This ensures that it stays dry rather than getting wet when you pack away the wet outer tent. After nearly two weeks of constant use, I have to say that the tent has lived up to its reputation and can see why its popular with many backpackers. I wont be selling this tent for another one, so here’s hoping it will last for many years! Tarptent do a one person version. I would buy one, but Im looking at something slightly lighter for my next single person tent- The Trailstar! One week away and we will be taking our first steps walking across Scotland. At long last the TGO Challenge has almost arrived- one week today at 9.00 we be signing out at Challenge control at Shiel Bridge taking our first steps walking across the country, something I’ve dreamnt about doing for many years and feel ready to take on this mighty challenge! For me, it is a holiday and couldnt think of something better to do for a fornights backpacking through the Glens and over Mountain Passes. Others may think- how can that be a holiday walking all that miles with a big pack on, and say- how can that be a holiday when you are meant to be relaxing? Truth is, I do find out relaxing- mentally anyway! Phiscally I will also feel better after too- giving my body a good workout. Half a day lying under the sun at a beach in Spain, I’d get bored and fidgety and want to be off exploring. I havent done as much training for this walk as I wanted to. It hasnt been too bad though with me and Lynn, getting away camping and bothying most weekends since January up up until mid March. I’ve had a persistant cold/ manflu since begining of April. It hung around for a month before I got rid of it and I was physically shattered so missed out on a few weeks of walking. Despite the minor setback, I feel very confident with managing this walk, and it spurs me on more so, knowing that we have raised a good amount of money for the charity SARDA Scotland- (Search And Rescue Dog Association). Earlier this week, I headed to Aberlour after finishing work mid-morning and took a walk over the Gownie to Dufftown and back to Aberlour along the old railway line. It started off quite hazy, then as I left Dufffown it was clear skies. It was the first time I had stopped at the Dufftown station- part of the Keith to Dufftown Railway. The trains only run at weekends, but they do meals and snacks on one of the carriages during the week. Perhaps I will walk the Isla Way from Keith and get the train back at some point soon. Our route across Scotland was finalized back in January. I chose a route taking in many glens and some mountain passes. Some people yomp across as many Munros possible on the challenge, but we wanted to spend more time enjoying ourselves rather than toiling with a pack every day climbing Munros. Low level much as possible with a few climbs here and there was what I had intended for, as I didnt want to do it on my first challenge- its the first time I will have backpacked for this length of time. Our starting point on the Challenge is one of a choice of 13 for everybody and ourstarting point is also the busiest one with a total of 70 challengers setting foot from Sheil Bridge next Friday. Im sure the first few miles will be busy, but after that- people will be heading up hills and taking different glens. We have manged to get a lift to Shiel Bridge next Thursday, courtesy of Dan and I’m even just looking forward to the drive across being passenger soaking up the views on the way. Thursday night, the bar at the Kintail Lodge will be packed with challengers- I will have to be strict with myself, as Im sure it will be a great evening meeting new people and exchanging stories with each other- with the beer flowing fast. I dont want to start my trek dehydrated with a hangover! TGO Challenge almost here and winter has returned! I cant beleive that the TGO Challenge is almost here. I’m sure in two weeks time that I will be rushing around madly worrying if I have forgot to pack anything and will not be able to sleep due to excitment! Two weeks of walking across Scotland through Glens and over passes, being self sufficent and camping most of the way. I have booked one night at a bunkhouse and we might be having the odd overnight in a bothy. Myself and my partner will be doing the walk together and are very much looking forward to it, no matter what the weather throws at us! Lets hope the wintry blast that has returned today doesnt last. The training for the walk has gone okay, although I admit that I had planned to do more walking preperation for this trip than I have done- this past few weeks I have came down with a bad cold which has hampered progress, but before that, we have been active most weekends this year, getting used to our heavy packs, setting up our new tent and making decisons on what items we will be taking with us. One item I have mulled over for a while is the stove. I have happily used a MSR Pocket Rocket stove for some time- which is a great little stove, but I’ve never been happy using it in a confined space especially with a bigger pot as Im always worried of knocking the pot over. I’ve now purchased a MSR Wind Pro 2 stove which is bulkier and heavier than my Pocket Rocket, but the centre of gravity is much lower- so much less risk of knocking over a large pan of boiling water. Other advantages of this stove, being that the gas canister does not screw directly onto the burner, and if I need to use the windshield- it will not overheat the gas cannister which was another one of my worries! I havent used this stove yet, but I am confident it will be a great addition on the challenge and many other camping trips! On Sunday I felt well enough to get out for a walk as my cold/man flu seemed to be subsiding! We left for Aviemore reasonably early on Sunday morning and arrived at the Sugar Bowl car park on the Ski road about 8.45. I thought I would take Lynn up the North East shoulder of Cairngorm and perhaps vist the El Alamein shelter which had visted previously on a walk a few months back. This is a lovely way to approach Cairngorm in itself- its a quiet route up the hill and plenty to see, although the path is rough and faint in places. The El Alamein Shelter was built on the steeps slopes above Strath Nethy back in 1963 by Army Volunteers. Apparently the precarious and odd site which the shelter was built on- was a mistake as the people who had built it were given the wrong grid reference! The shelter is not wind nor water tight and I beleive it has been in quite some state of disrepair over the years, but there has been efforts to rebuild and patch it up. It does give certain amount of shelter from the rain and biting wind and I could see myself spending a night here one night- but I would take my Bivvy bag to keep dry and for two people with sleeping bags it would be cramped but just possible I think! After lunch in the shelter we made our way back up the slopes and headed upwards towards Cairngorm. A nasty hail shower had started and with increasing winds, the hail stang our faces. At this point I could make out the top station and with deteriationg weather, we decided to miss out the summit and head to the station for a warm coffee before heading back down to the car. The Great Outdoors Challenge walk across Scotland starts on the 12th of May and our walk starts from Sheil Bridge on the West and finishes at Montrose 12 days later. The Great Outdoors Challenge 2017- thoughts about my biggest forthcoming adventure yet. I cant believe that its eight weeks today that we will be all packed and heading to Sheil Bridge on the West Coast to start our walk across Scotland. It was last october when we sent away entries from TGO magazine in hope that my partner Lynn and I would be accepted for this years event, then in November we were delighted to recieve an email to tell us that we had a place on the challenge. We have been doing some training for the walk- not so much distance, but more importantly getting used to carrying big packs and finding out what equipment works and what doesnt. I caught the wilderness backpacking bug a couple of years back when we did a few overnight winter trips to Bothies and it progressed to wild camping in glens when spring finally came! My favourite trip to date has been getting the train into the remote Corrour station and backpacking over the Ben Alder hills. It was hard work carrying a heavy pack over the summits, but the rewards and satisfaction I gained from doing that were immense. The Challenge is a yearly event which is now in its 38th year and has proved very popular with people taking part from all over the world and the number over people taking part is capped to 300. Its not a walk where 300 people walk together on one route- that could cause a lot of problems, namely accomodation for a start! There is a choice of ten starting points on the West and you can finish anywhere on the East between Fraserburgh and Arbroath- all you have to do is pick your starting point, plan a route through some of Scotlands great scenery and then submit your route to the challenge vetters who are on hand to give you any advice etc on your chosen route. Being our first ever challenge and biggest ever walk carrying all our camping gear etc, I chose a reasonably straight forward route through glens and over a few mountain passes. Our route takes us through Glen Affric, over the Corrieyairack Pass, through Glen Feshie to Braemar, over to Glen Esk and finishing at Montrose. Although I have already walked parts of our planned route before- the attraction to me is linking everything up together to make the walk of a lifetime possible- its quite interesting to think that years I cycled from Fort William on the West to Rothes which is almost 15 miles from the north east coast in a day, and every wednesday with work I drive from Buckie in the east to Oban in the west and back in one day! Our walk will take us almost two weeks! Most nights we will be camping which will be a mixture of wild camping and staying at campsites on Villages we pass through when we need to restock on food supplies, camping gas etc. My attention has also turned to our equipment for this trip. I’m not quite at the stage of becoming an ultralight backpacker, but Im slowly making the transition- the lighter the better especially for a 185 mile walk! Boots- I hardly ever wear my leather boots now, great for plodding though snow covered hills during a winter hill walk but way to heavy a clumsy in my opinion for backpacking. This past year I’ve been using my Meindl Minesotta Pro GTX boots which are lighter than my leather boots and more comfortable, but I now want to go even lighter. A lot of people have gone down the road of wearing trail shoes for backpacking which I have tried, but Im not concinced as yet. I have ordered a pair of Salomon X Ultra Mid 2 GTX which Im hoping to use on this walk. They are basiclly trail shoes with a higher cuff around the ankle. Im pretty confident these will be perfect for the challenge, but will need a few test runs first before I decide whether I will be wearing these or the Meindls on the challenge. Clothing I will be wearing for the challenge is sorted out, but depending on the long range weather forecast- it may vary what I will be taking at the last minute. Lets hope its a heatwave, but it is Scotland and by what I’ve read on previous challenge reports- be prepared for anything! Accomodation will be our Tarptent Scarp 2 Tent which I bought last Autumn. Previously to this we had a Terra Nova Polar Lite Micro 2 tunnel tent- which was a cracking small tent, but it was small. It could stand up to all sorts of weather, was easy to put up quickly- but it was simply to small for two people. I had been looking at the Scarp 2 tent for some time and one evening my partner Lynn had found a second hand one for sale. It was in good condition and had little use, so I just had to buy it! So far I’ve been pleased with my purchase, its far roomier that the previous tent. We now have a porch each too! The tent weighs in at a respectable 1.8 kilos and it came supplied with the optional 2 cross over poles for use in winter and very windy conditions- these poles take the weight of the tent up to 2.3 kilos. If the long range forecast looks good for the challenge, then I intend to leave out the extra poles for the challenge thus saving even more weight- every gram counts! Instead I’m going to do what other Scarp 2 owners have done and make a couple of additions/modifications and add a few extra guylines which will make the tent more secure in high winds at a minimal weight gain. I was hoping to get these modifications done today, but the high winds have put stop to this plan! I have only one worry about the trip, which is an on going ankle problem I’ve had for years. After walking considerable distance especially with wearing my heavy pack, I get this pain under my left ankle bone and it is more pain walking when the uphill slope is on the left of my foot. I always wear superfeet which do help to a degree and I do wear custom made ones in my walking boots. I read with great interest in the latest edition of the Scottish Mountaineer magazine, a gentleman who also had problems with his ankle, he too had tried Superfeet Insoles- but this didnt cure his problem. Then he consulted a podiatrist who soon diagnosed his problem and got custom Interpod Othoritcs which has given this gentleman an 80% improvement. From what I have read in this article- I think these insoles would help correct or alleviate my problem to a big degree. Im now waiting to hear back from the local Podiatrist to book an appointment- fingers crossed they can help. Im looking forward to this walk for various reasons- meeting all the like minded people along the way, two weeks doing what I love the most, the achievment of it all and of course the craic in the pubs along the way with other challengers and Lynn when we stop over at campsites in villages! Although lots of people will be walking in pairs and on their own- its quite a socialble event Im lead to beleive! I will be posting on here over the next few weeks on our progress of our training, more about gear we will be using, if I get my ankle problem sorted and of course my tent modifications! We have also decided to use this opportunity of this walk to raise money for SARDA Scotland- Search And Rescue Dog Association. Is used by Police and Mountain Rescue to locate missing people in the mountains or low ground areas, including children and people with dementia. Has handlers who are experienced mountaineers, and trained in casualty care. Covers all of Scotland, 24 hours a day, 365 days of the year. Please take a minute or two and clink onto our link below to find out more about our fundraising- thank you. Meall Chuaich, to me it should mean hill of the cloud- but actually it means hill of the quaich. Fifteen years ago I was on a weekend meet with the Granite City Hillwalkers club. On the Sunday, the forecast did not seem promising. Rather than just wasting our weekend and driving back home, we decided on an easy straight forward relatively short hill walk and set our sights on Meall Chuaich- our hill for the day. Weather was awful- it was wet, windy and cloudy. I never saw much of the hill that day, nor of the surrounding views. Infact the views I can remember of that day were of the ground below my feet and that of my friends if they were within 30 meters of me! My Friend Stuart had called me earlier in the week asking If I wanted to go for hill walk and the Cairngorms were to be the destination- first thoughts were Ben Macdui, but I’ve ascended it many times this year and fancied somewhere different, then our thoughts changed to the Feshie hills, then I remembered-a slightly further drive but not by much, Meall Chuaich near Dalwhinne. The forecast was promising and it was worth more, than just one ascent that it has had by me. This time there would be no could and cracking summit views I thought! The temperature was hovering at zero when I left Buckie and by the time I arrived in Dufftown at 7.20 to pick up Stuart, it had dropped to minus 2. Nearing Cromdale it was now minus 6, then it started dropping slowly as we drove between Grantown and Aviemore. The Strath between Nethy Bridge and Aviemore was filled with freezing fog and I think it had dropped to minus 8 as we approached Aviemore. On reaching the lay-by on the A9, we soon were ready for the walk along the track at the viaduct to the base of Meall Chuaich. The central cairngorms were cloud free as we passed Aviemore, but the Drumochter hills had pockets of cloud on the summits, but the forecast was good and so was our hill. We had reached the end of the track at the loch at the base of the hill and now for the short steep section which wasnt too bad and we made height quickly, but as we did- a drifting cloud decided to settle on the summit dome of the hill! All to soon, we had reached cloud level and we nearing the summit. It was a small breeze at the summit, but with the windchill- it felt very cold and we were glad of a large summmit carn to shelter us from the wind whilst we ate our sandwiches. A lady whom we passed earlier with two dogs wasnt long in catching up at met us at the cairn. She explained to us that she had forgotten her rucksack and left it in the car, the map was in her jacket pocket- but her compass was left behind in the rucksack! She said that she might have to follow us back down. We saw her at the car park earlier and the lady did say to me at the car park, that she was walking Meall Chuaich. I thought it was funny that she set off without a pack. I’m glad to say that the lady did make it off the hill no problem- navagation wasnt really a problem coming off the hill- five minutes down the hill, the cloud lifted! What struck me and Stuart was- how could you leave your rucksack in the car and forget to put it on? If only I had been ten minutes late this morning I had thought to myself- I would have had a view form the summit! Weather only improved on the way down and we stared to warm up again out of the wind. By the time we picked up the landrover track, the temperature had risen significantly and we stopped to take some layers off. The walk out down the glen was pleasant and full of grouse chatting away to each other! A more memorable experience than my first walk on this hill. It took us in the region of four and a half hours and I would thoroughly recommend this walk as an introduction to the Munros- one of the easier ones to start off with.